EVENT IS AT CAPACITY, REGISTRATION IS NOW CLOSEDTACDC, in partnership with the Federal Reserve Bank of Dallas, is hosting the Texas Opportunity Zone Summit in San Antonio at the Federal Reserve Bank. Attendees will learn how Opportunity Zones (OZs) operate, how developers and investors are navigating and structuring deals, and how Texas cities and low income advocates can best leverage OZs to ensure equitable development in low income communities across Texas. Attendees of the Texas Community Development Conference receive a discounted registration. For more information, see below. 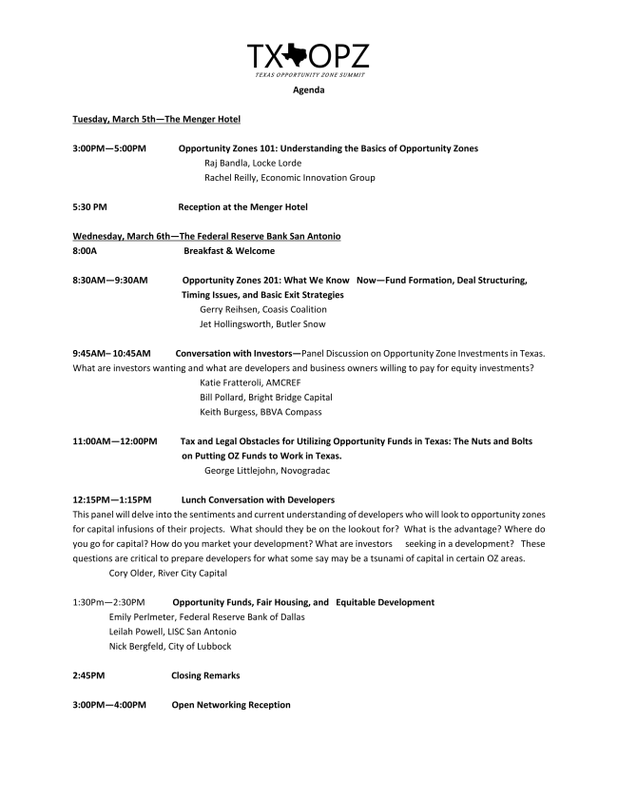 9:45AM – 10:45AM Conversation with Investors - Panel Discussion on Opportunity Zone Investments in Texas. What are investors wanting and what are developers and business owners willing to pay for equity investments? 11:00AM – Noon - Tax and Legal Obstacles for Utilizing Opportunity Funds in Texas. The Nuts and Bolts on Putting OZ Funds to Work in Texas. 12:15PM - 1:15PM: Lunch Conversation with Developers - This panel will delve into the sentiments and current understanding of developers who will look to opportunity zones for capital infusions of their projects. What should they be on the lookout for? What is the advantage? Where do you go for capital? How do you market your development? What are investors seeking in a development? These questions are critical to prepare developers for what some say may be a tsunami of capital in certain OZ areas. 1:30PM - Opportunity Funds, Fair Housing, and Equitable Development. How cities and counties can encourage OZ investments without creating displacement in low income communities. If you would like to become a sponsor for the Texas Opportunity Zone Summit, please click the button below, or contact Robyn Murphy at 512.916.0508 or robyn@tacdc.org. There are many opportunities to show your support! The Texas Association of CDCs is hosting the annual Texas Community Development Conference March 3-5, 2019 at the Menger Hotel in San Antonio. Attendees to the Community Development Conference receieve a disounted registration to the Texas Opportunity Summit. Please click the link below for more information.